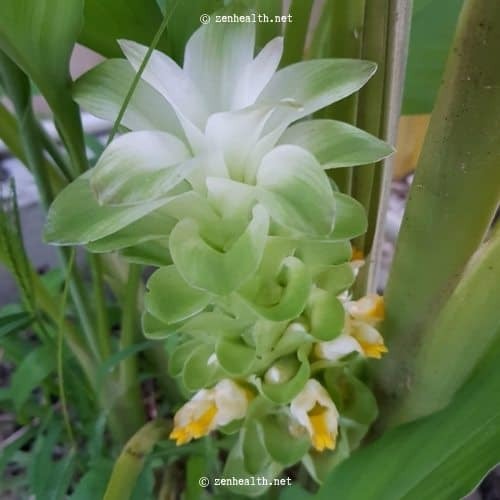 My turmeric plants matured recently. Yay! I was so excited. 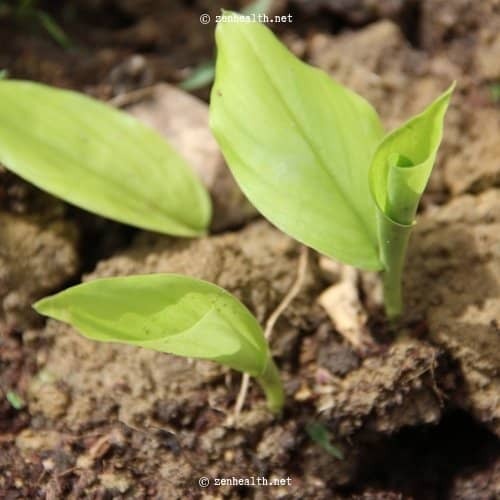 It’s my first time growing turmeric. So I had the marvelous idea of blogging about it! #BloggerLife haha! But why stop there? I’ll try to explain how to make turmeric powder from them too. Before the plant even matured, it flowered. I had no idea it did that. 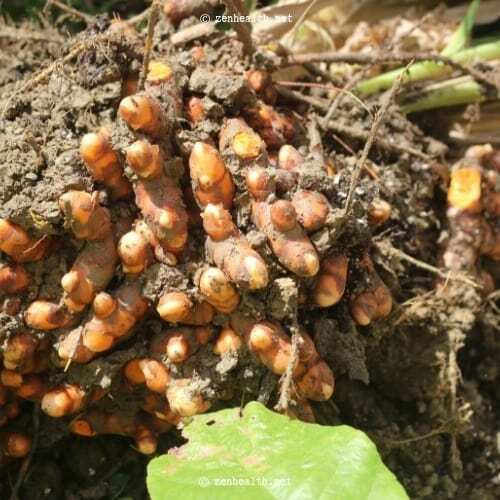 I mean I know plants flower and everything but I thought turmeric just did leaves and rhizomes (roots). Silly me! I like the flowers. They are so simple and pretty. What do you think? A couple months after it flowered, I thought it died. Everything turned brown and dried up. The leaves fell and everything. But my mom said that’s how you know it’s time to harvest. Basically, turmeric tells you it’s ready! Hah! It took mine six months to get there. Everything comes up in one giant chunk. Nature is glorious! Look at all that organic-ness. 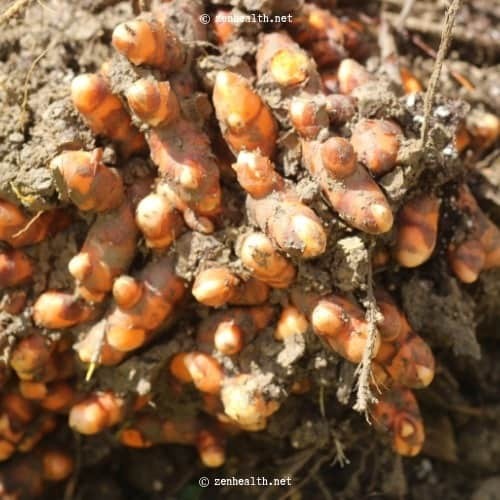 I pulled apart some of the rhizomes so you could see that rich, yellow-orange color! I should make one thing clear. 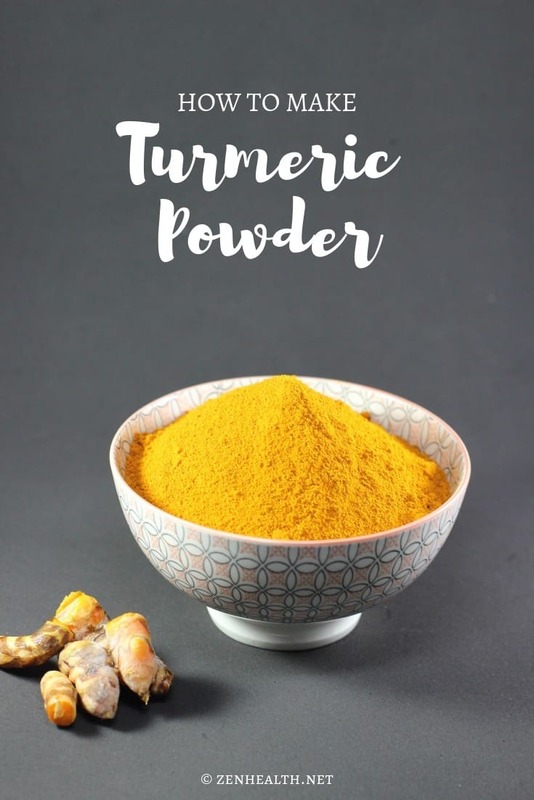 You don’t need freshly harvested turmeric to make the powder. You can use store-bought turmeric. It’s totally fine. 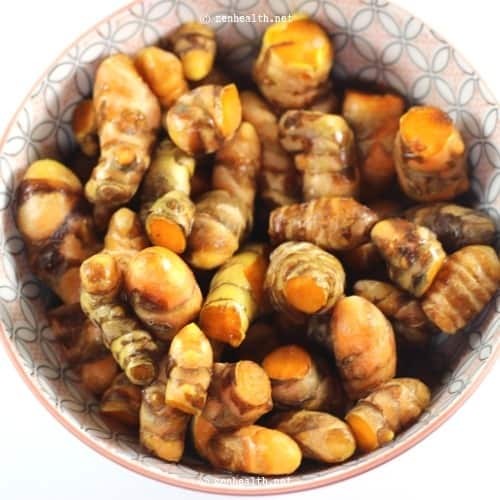 The store-bought turmeric may have less moisture than fresh turmeric and should dry faster. Ok let me get into explaining how to make turmeric powder. All you really need is a small knife, grater, drying sheet, coffee grinder (or food processor) and a sieve. That’s it! You may want to use food grade gloves too since the yellow, turmeric color will stain your hands. Detergent should get the color out within a day or two though. Wash and scrape the skin off the rhizomes. The little knife works great to do this. 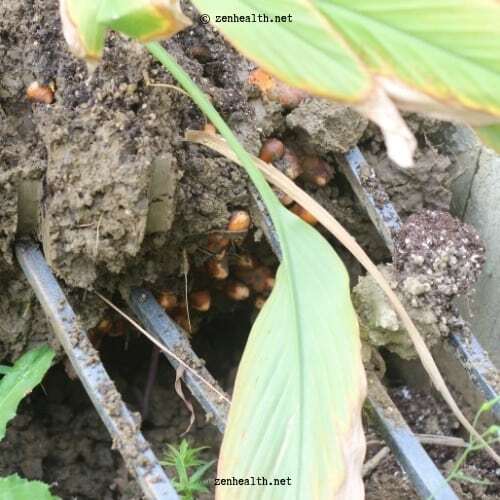 Use a fine grater to grate the rhizomes. Having tiny strands speed up the drying time. Spread the grated turmeric thinly on a drying sheet. I use a stainless steel tray. Glass is fine too. But plastic is a no-no; unless you want wonderful, turmeric-colored trays. It stains! On a hot summer day, it will take about ten hours for the strands to crisp. That’s what you are looking for. That dark, crisp look. The thinner the layer of turmeric, the fast it will dry. You can also pop the tray in a food dehydrator for a couple hours too. I never tried to dry the strands in the oven so I can’t say what the best temperature to use is or how long it will take. If you have tried it, let me know what you did in the comments. I use a coffee grinder. But any appliance that can give you a fine consistency will work. Sift the powder and regrind the larger bits. I didn’t get a chance to take high quality photos during the process 🙁 🙁 These are as good as they got. Do you see how dark the dried turmeric looks? (It’s the bottom left photo). That’s what you are looking for when drying the strands. I store the bulk of my turmeric powder in the fridge. You can keep a little (a tablespoon or so) in your spice rack too. It stays well and lasts long. I usually make small batches so it never really goes bad. 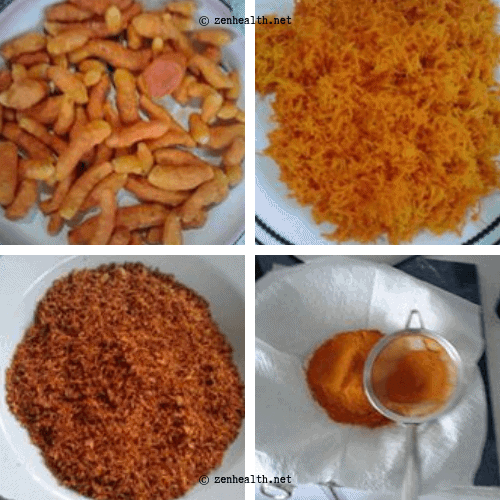 Now you know how to make turmeric powder step by step. Pin this for later. One last thing. It seems I didn’t get all the rhizomes out when harvesting. These little ones popped up a month after. I guess I’ll be making more turmeric powder in six to eight months, haha! Liked this post? Then you’ll love these: 18 Hearty Soup Recipes! Wow I have never thought of doing this and I reguarly use tumeric in cooking. Found this really interesting. ooo damson vodka! I’d love to read about how you do that! Thanks for stopping by Lisa. This is so neat! I recently started an herb garden and have been thinking about branching out to other spices. 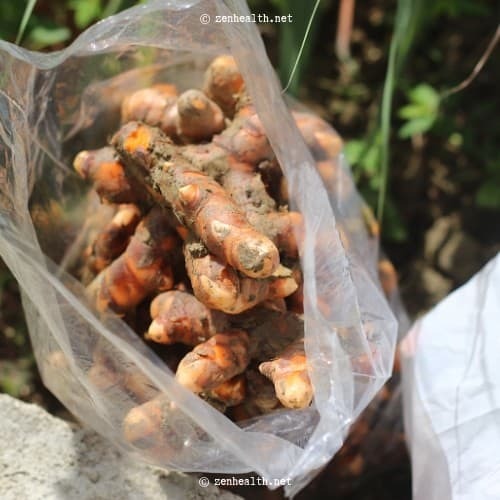 I had mo idea how turmeric powder was made though! Thanks for sharing. Herb gardens are fun! Rosemary, basil, and thyme are musts! Ros, what a fun project! 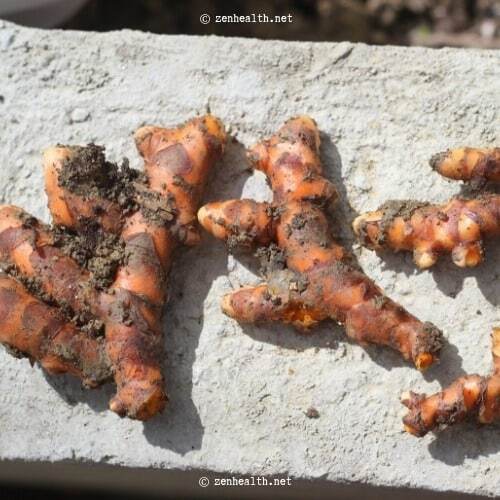 I never even considered growing my own turmeric. Now I can’t wait to give it a try. Your tips are super helpful! Absolutely amazing step by step instructions to make this beautiful and healthy spice. Thank you Ros !